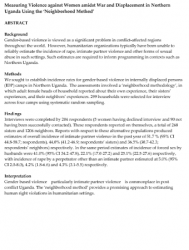 This study, published in the Journal of Epidemiology and Community Health, sought to establish incidence rates for gender-based violence (GBV) in internally displaced persons (IDPs) camps in Northern Uganda. The assessment involved a ‘neighborhood methodology’, in which adult female heads of household reported about their own experience, their sisters’ experiences, and their neighbors’ experiences. It found that gender-based violence – particularly intimate partner violence – is commonplace in post-conflict Uganda.